The making of "Poli - an experiment blended with creativity "
Decided to make Poli (Obbattu in Kannada) on the occasion of Ugadi. I placed the recipe book on top of the microwave and started the process. The first line in the recipe said "Soak the bengal gram dhal for some time". 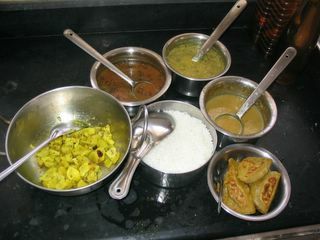 I've been cooking for the past three years but I can never remember that Bengal gram dhal is kadalaparuppu. A few minutes went off in looking at the index and confirming that it was indeed kadalaparuppu. Next question came immediately to my mind - What is "some time"? How many hours do I need to soak the dhal? I decided "Let it soak for one hour". Next came the big challenge. The second line was "Take maida or white wheat flour and make it into a smooth dough". Good, I have an option to choose since I didn't have maida at home. I took the wheat flour but it wasn't pure white. Forget it, so what if the colour doesn't match the exact requirements? I made a smooth dough but it became a bit soggy. So I had to allow the dough to soak for a while so that the moisture gets absorbed. Anyway, I had to wait till the dhal gets soaked. The next one hour was filled with anxiety and a hint of tension. This happens whenever I try a new, complicated dish. Blog hopping came to my rescue for that crucial one hour. I returned back to see the dhal well soaked but the wheat dough was still soggy. I had to do some patching to bring it to a consistent, non-sticky state by adding some more wheat flour. Then I started boiling the dhal and within 10 minutes, it got cooked well. Meanwhile, I broke the jaggery into pieces and took a cup of shredded coconut. Next the dhal had to be ground to a coarse paste. I was skeptical to add water while grinding. What if it turns to a liquid consistency? I had a backup plan that if turns that way, I can convert it to a payasam (kheer). Thankfully, the dhal was in a semi-solid state after grinding. Next comes the interesting and tough task - melt the jaggery. Initially it started to stick and hence I added a little water. My hands were paining a bit when I was stirring the jaggery continuously. Then the dhal and coconut gave company to the melting jaggery. The aroma of this combo was mesmerizing and my taste buds got activated. Even after 15 minutes of continuous stirring, the mixture didn't come to a consistency by which I can make small balls out of it. Another 15 minutes passed with a good amount of doubt and anxiety occupying my senses. I came back to the poli ingredients and started to make balls with the wheat dough. I could feel the stickiness in my hands. "No problem, add some more flour", instructed my brain. The actual execution steps began. (1) I made a small chapati out of a dough ball. Yippee, it didn't stick to the plate. (2) I placed a small ball of the jaggery mixture and rolled it. (3) Praying to God, I started making chapati again out of the now-increased-in-size ball. Oops, it started to stick and I couldn't take it out. I took another ball, same steps, same result. I was feeling damn hungry by then. I realized that this is not going to work out. I followed steps (1) and (2) but instead of making a big chappati, I made into a shape of kozhukkatai (semi circular shaped with jaggery filling) and fried it. Thank goodness, the wheat dough was little in quantity and the jaggery mixture was more. I was able to make 5 kozhukkatais and the rest of the jaggery mixture into a yummy payasam. The time was 2:30 and we tasted my poli-turned-into-a-kozhukkatai-and-payasam with lunch. It wasn't tasting that bad after all the effort that had gone into it's making. My landlord brought us a couple of Polis from his house. I was comparing my version with that. How different world is and how different cuisines are? btw, "My hands were paining a bit when I was..." is probably grammatically incorrect.. though this is used often in colloqual, it should be "My hands were hurting..." or "My hands started to hurt...". only ate polis .. never made them ..
very nice .. you are experimenting a lot .. continue continue .. become an expert chef ..
when are you inviting us to dinner ?